PK-101C- PinMaster with #1 remote identifier. PK-101A- Its built-in RJ45,RJ12 and Coax F test connectors. PK-101 R2-8 Smart remote identifier #2 - #8. PK-101 Kit PinMaster S1 W #1 - #8 Remotes and Net Probe. 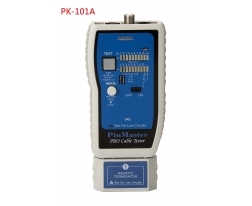 PK-101PL/PK-101CPL: PinMaster with PoE & Line detector. (A) It features a smart Learn mode with memory capacity for testing large quantity standard or custom cables for PASS/FAIL a snap, this provides much faster and easier testing especially for production environment or larger installations. (B) The unit has an unique function displayed test results in wiremap TX (near end)/RX (far end) with pin by pin status on the main unit on remote testing. (C) Identifies and maps up to 8 remote cables and locations at one time, just one trip to the junction box saving time and improving efficiency. (D) PinMaster with Hub Blink and Toning mode is designed to locate and identify an active Ethernet port for network installation and maintenance. It sends a link pulses to blink a link indicator to find a Hub or switch port to confirm connected active configuration, simultaneously output 2 powerful tones for tracing active network cables on a switch or HUB, use with Net Probe(PR-06P) for inactive and active network tracing and fault isolation. The unit also features a low battery indicator. 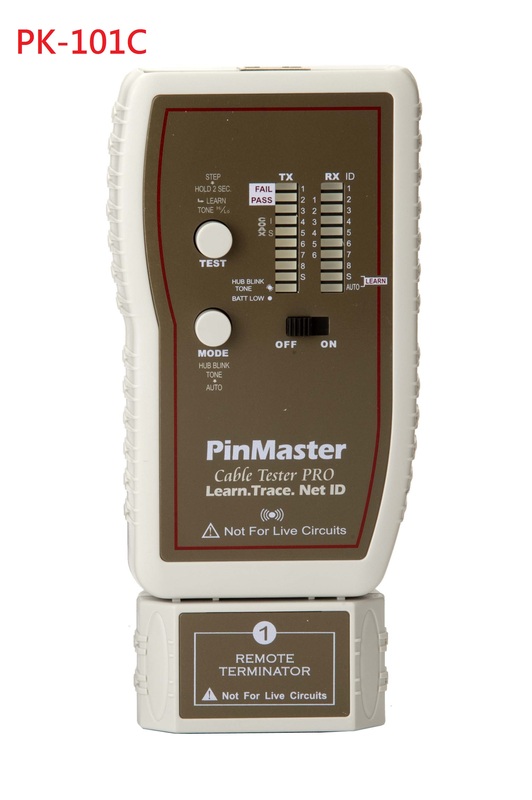 These features make the PinMaster an easy-to use and affordable tool for Professional Commercial, residential, datacom, telecom and cable installers and contractors as well as cable assembly houses. 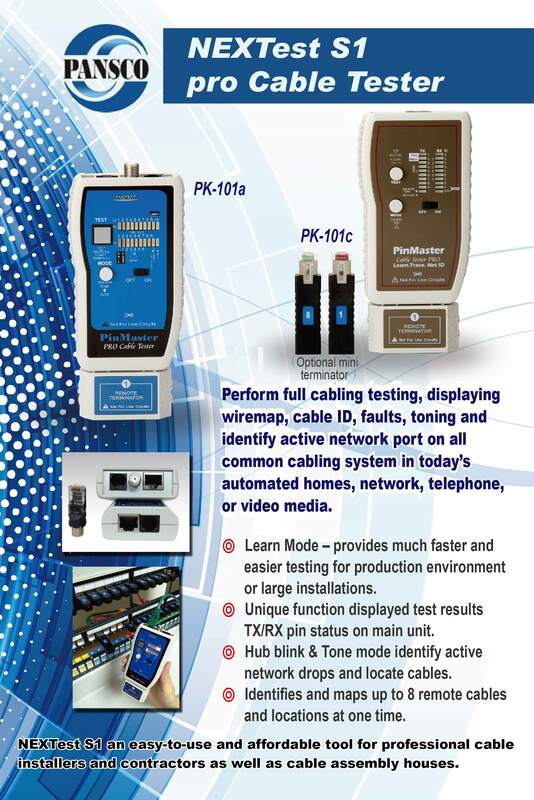 PK-101PL/PK-101CPL : Additional features include detecting the RJ45 outlet for PoE (power over Ethernet) existence and identify type of PSE either end-span or mid-span in a second as well as detects the presence of phone line of voltage and checking polarity is also used to protect tester damage from live circuits. 1. Tests and troubleshoots data, telephone and Coax cables over 300 M.
2. Test results displayed TX/RX with pin by pin status on the main unit. 3. Learn / Quick test mode for testing large quantity cables for PASS/FAIL a snap. 4. Identify Hub / Switch port LED where the network cable or port is terminated. 5. Quickly identify unknow RJ45 outlet for active Ethernet. 6. Transmits 2 selectable powerful tones for tracing inactive and active network cables on a Switch or HUB. 7. Remote unit attached to main unit for patch cable testing and easy storage. 8. Identifies and maps up to 8 remote cables and locations at one time. 1.Remote unit includes PoE and line voltage and polarity detection. 2. Detects network outlet presence of PoE. 3. Displays type of PoE either end-span A or mid-span B. 4. 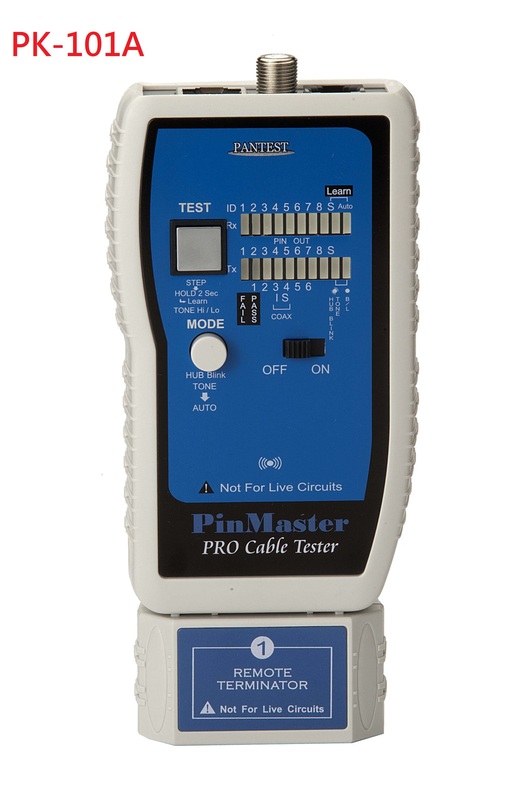 Checks Line voltage and polarity to protect tester damage from live circuits. PK-101C: Built-in RJ45 Jack compatible with RJ11/12. PK-101A: Built-in RJ45, RJ12 and Coax F test connectors. Standard and custom configuration cables. STP, UTP, USOC 2,4,6,8 and Coax cables. Detects opens shorts reversed and miswires, as well as ID number. 9V standard or alkaline battery. 0℃ - 50℃ / 32℉ - 122℉.